This classic dish uses a premium jar of tuna, but if you want to go all out, try it with griddled fresh tuna steaks instead. For the dressing, whisk together the vinegar, mustard, garlic and oil; season and set aside. Lower the eggs into a pan of cold water and bring to a simmer. Cook for 6 minutes, then cool under cold running water; peel and halve. Set aside. Cook the potatoes in boiling water for 5 minutes, then add the beans and cook for a further 4 minutes until they are tender; drain. Put the lettuce leaves on a plate and pile on the cooked vegetables. 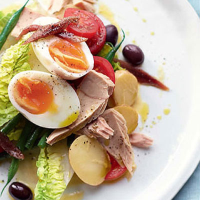 Top with the tomatoes, olives, tuna chunks, halved eggs and fi nish with the anchovies. Drizzle the dressing evenly over the salad and serve.